Fall summits gave transportation professionals across the country a forum to learn about the innovations in the fourth round of Every Day Counts (EDC-4), the Federal Highway Administration’s partnership with stakeholders to rapidly deploy innovations. The summits—held in California, Florida, Maryland, Minnesota, New York, Oregon, and Texas—introduced participants to the 11 technologies and practices FHWA will promote in 2017 and 2018 through EDC-4. Interactive working sessions provided an indepth look at the innovations, how the transportation community is using them, and assistance available to help more States deploy them. Participants met in State caucuses to start planning which EDC-4 innovations to pursue over the next two years. Their recommendations will be discussed by State Transportation Innovation Councils (STICs), which bring together public and private stakeholders in each State to evaluate innovations and spearhead deployment. 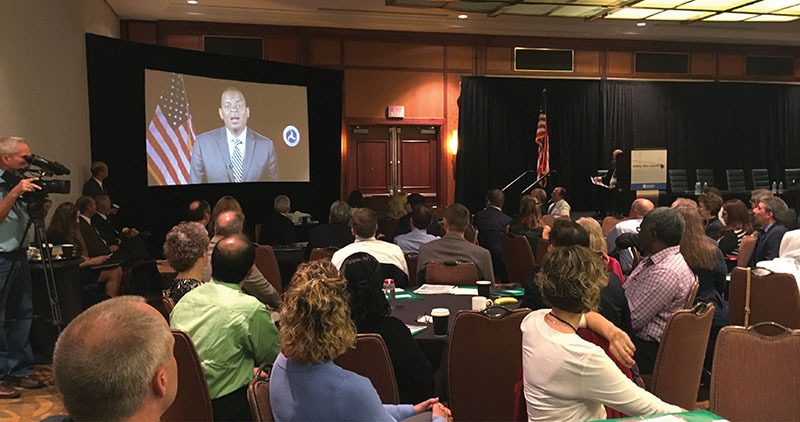 U.S. Transportation Secretary Anthony Foxx spoke to Baltimore summit participants via video. 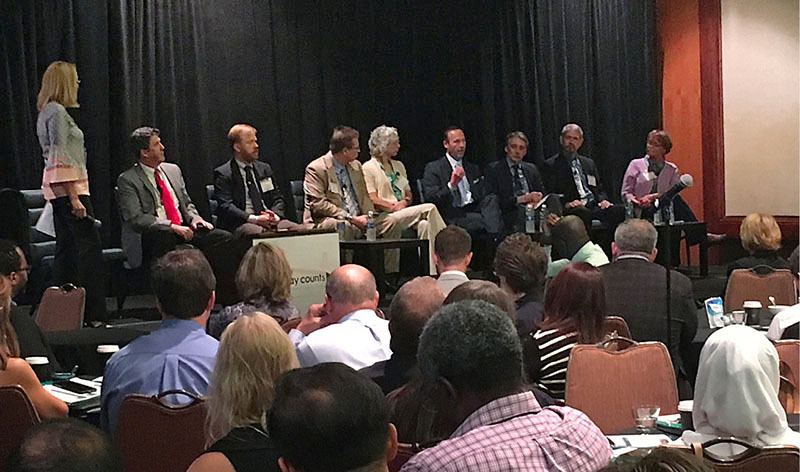 “You bring a commitment to innovation that’s really changing the way transportation is delivered to the American people,” Federal Highway Administrator Gregory Nadeau told participants at the Baltimore, MD, summit in October 2016. The 2015 Fixing America’s Surface Transportation Act includes EDC by name and directs FHWA to continue working with its partners to deploy new technologies. A memorandum of understanding between FHWA and the American Association of State Highway and Transportation Officials Innovation Initiative enhances the two organizations’ national efforts to promote innovation. The national STIC network, completed in 2016, will sustain a permanent culture of innovation. Automated traffic signal performance measures modernize traffic signal management by providing high-resolution data to actively manage performance and improve safety and customer service while cutting congestion and costs. The effort on collaborative hydraulics: advancing to the next generation of engineering (CHANGE) uses hydraulic tools to improve understanding of complex interactions between river or coastal environments and transportation assets, enabling better design and more efficient project delivery. Community connections are performance management approaches for planning, designing, and building transportation projects that promote connectivity, revitalize communities, and improve public health and safety. Data-driven safety analysis uses tools to analyze crash and roadway data to predict the safety impacts of highway projects, enabling agencies to target investments with more confidence and reduce severe crashes on roads. e-Construction and partnering: a vision for the future involves using paperless technologies to enhance partnering among stakeholders on construction projects, improving communication and workflows while streamlining project delivery. Integrating the National Environmental Policy Act and permitting processes enables concurrent, synchronized environmental and permitting reviews that save time and reduce costs for the agencies involved. Pavement preservation (when, where, and how) involves applying a pavement preservation treatment at the right time on the right project with quality materials and construction, offering a critical investment strategy for optimizing infrastructure performance. Road weather management—weather-savvy roads integrates mobile observations and Pathfinder strategies in collaboration with the National Weather Service that can help agencies manage road systems and inform travelers ahead of and during adverse road weather conditions. Safe transportation for every pedestrian (STEP) features cost-effective countermeasures with known safety benefits that can reduce pedestrian fatalities at uncontrolled crossing locations and unsignalized intersections. Ultra-high performance concrete can be used to create the simple, strong, long-lasting connections needed for successful construction using prefabricated bridge elements. 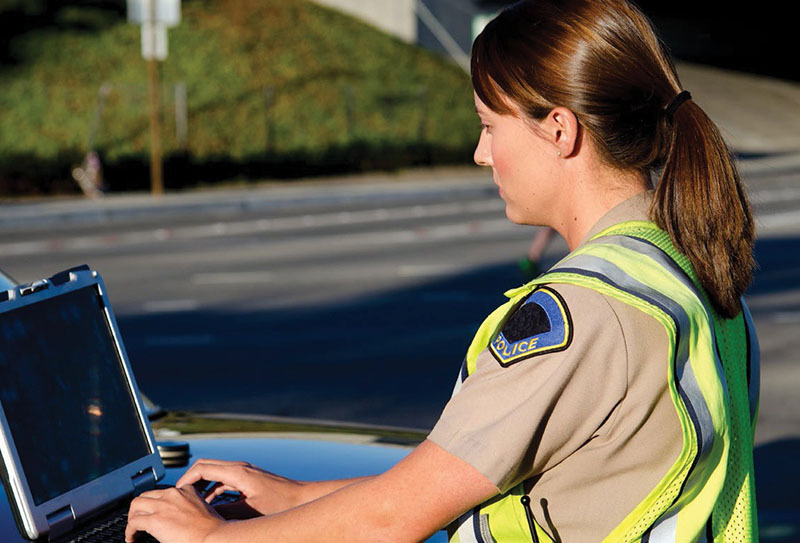 Using data to improve traffic incident management focuses on increasing the amount, consistency, and quality of data collection to support development of performance measures for evaluating and improving traffic incident response programs. View introductory webinars on the EDC-4 innovations. With Every Day Counts round four (EDC-4) underway, agencies across the Nation are deciding which proven innovations they will incorporate as standard practice in the next two years. But transportation leaders have a larger question on their minds: How do we make the adoption of innovation part of our everyday work, ingrained in our culture? At the EDC-4 summit in Baltimore, MD, leaders from seven States and Federal Lands Highway took part in a panel discussion to examine that question and share ways they’re building a culture of innovation in their organizations. What general advice would you offer other States? At the Baltimore summit, transportation leaders exchanged ideas on building a culture of innovation in their States. How can States overcome barriers to innovation? Can you offer some practical tips to help States get started? All participants agreed that the question was not if, but how agencies should become more innovative. “Together, these milestones will ensure that the cycle we’re engaged in today of identifying, considering, and deploying innovation will become an ongoing part of our industry,” Nadeau said. 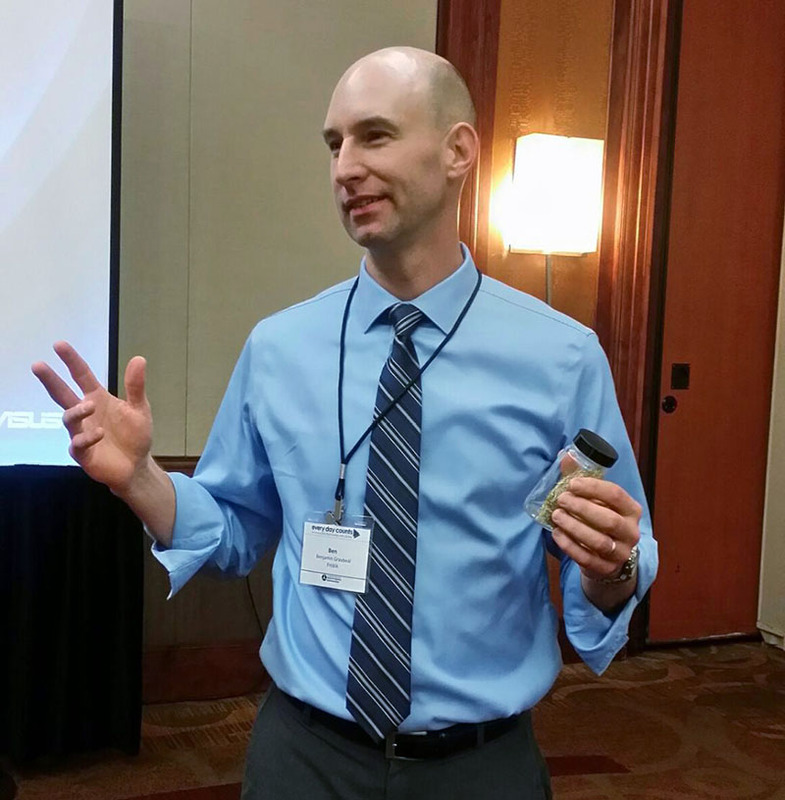 In an EDC-4 innovation session, Benjamin Graybeal of FHWA discussed the benefits of using ultra-high performance concrete connections to build long-lasting bridges. Attending the EDC summits every other year offers District Department of Transportation staff members an opportunity to learn about new ideas that can improve how they deliver transportation programs to the public, said Director Leif Dormsjo. The EDC initiative encourages State transportation departments “to be innovative, to take risks, to find new and better ways to do things. That’s why it’s important for DOTs as well as for taxpayers,” said Maryland Transportation Secretary Pete Rahn. 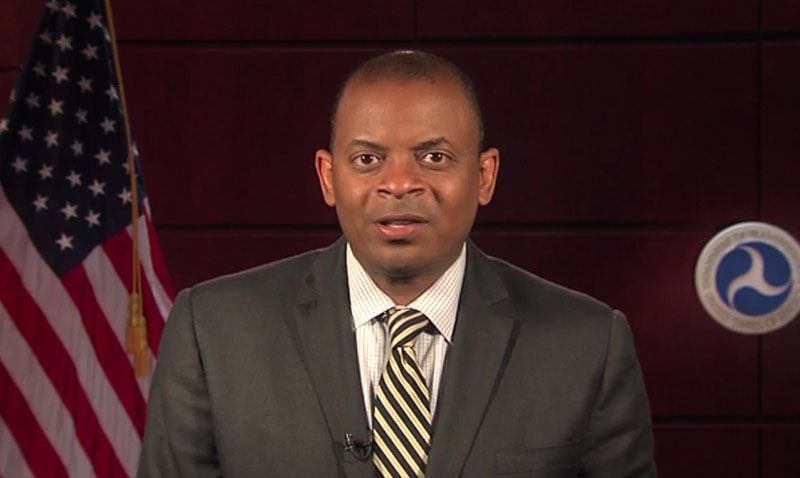 U.S. Transportation Secretary Anthony Foxx welcomed participants to the EDC-4 summits via a video presentation. Thomas Harman, director of the FHWA Center for Accelerating Innovation, which administers the EDC initiative, issued what he called a “two percent challenge” to summit participants. FHWA formed deployment teams for each EDC-4 innovation to help States and their partners with implementation efforts. Using feedback obtained during the summits, the teams developed plans to provide the transportation community with technical assistance and training, including workshops and peer exchanges. FHWA also offers assistance and funds through the STIC Incentive and Accelerated Innovation Deployment (AID) Demonstration programs. The STIC Incentive program provides up to $100,000 a year per State to help STICs make innovations standard practice. The AID Demonstration program awards funding of up to $1 million for highway projects that use proven innovations in any project phase. An ideal traffic incident management (TIM) program relies on efficient data collection, analysis, and reporting to measure performance and identify where and when it can be improved. “If it gets measured, it gets performed,” said Paul Jodoin, manager of the Federal Highway Administration’s TIM program and a leader of the Every Day Counts (EDC) team on using data to improve TIM. Roadway clearance time is the time from the first recordable awareness of an incident to the first confirmation that all lanes are available for traffic. Incident clearance time is the time between the first recordable awareness of an incident and the time the last responder has left the scene. Secondary crashes resulting from the original crash take place at the primary crash scene or in the queue in either direction. TIM-related data can be collected with existing advanced transportation management systems, computer-aided dispatch software, electronic crash reporting systems, and smart devices. A few agencies already collect data with each of these systems. Arizona, for example, easily modified its Traffic and Criminal Software—or TraCS—system at a low cost to collect data for the three TIM performance measures. Tennessee uses a locally developed electronic crash reporting system that collects data for two of the key performance measures. As traffic incident management activities increase, so does the need to capture data that can be used to assess program performance and drive improvements. Increased transparency by increasing the amount and quality of data collection allows agencies to demonstrate program effectiveness through quantified safety and economic benefits. Funding justification through the use of comparable data reporting can help convince decisionmakers that funds are needed for TIM resources. Accelerating data collection and including it in performance management will help TIM programs realize their full potential for keeping motorists and incident responders safer and highways clear. Improved operations can result from collecting key TIM data by providing agencies with the information needed to address when and where improvements can be made. Better outcomes can result from expanded TIM data collection by boosting the measurements needed to improve program performance, resource management, and planning processes. Incident data may not be timely, consistent, or complete. Systems may be incompatible for sharing and integrating data. Leadership may need to be convinced to allocate funding for this innovation. Responder agencies may have competing objectives. The Michigan Department of Transportation produces a monthly TIM performance report for the Southeast Michigan Traffic Operations Center and the agency’s western region. Michigan creates a number of graphs that show average roadway clearance times and incident clearance details. “That’s a perfect example of where we’d like to go as a Nation,” said Jodoin. Another example comes from the Virginia Department of Transportation, which produces monthly and quarterly TIM performance reports. Graphs show trends in average incident clearance times and other data. During the EDC-4 cycle in 2017 and 2018, FHWA will track the number of States that collect data on all three TIM performance measures, collect and use data, and add at least one performance measurement to electronic crash reports. The EDC-4 effort allows FHWA to work with and support agencies interested in moving to the next level, Jodoin said. That next level would continue to enhance safety and efficient mitigation of roadway incidents. View an EDC-4 Webinar on using data to improve TIM. See the National Cooperative Highway Research Program’s Guidance for Implementation of TIM Performance Measurement Web page for an overview and model database. Visit FHWA’s TIM Knowledgebase for tools and resources on practices and performance measurement. Contact Paul Jodoin or Kimberly Vasconez of the FHWA Office of Operations for information and technical assistance. 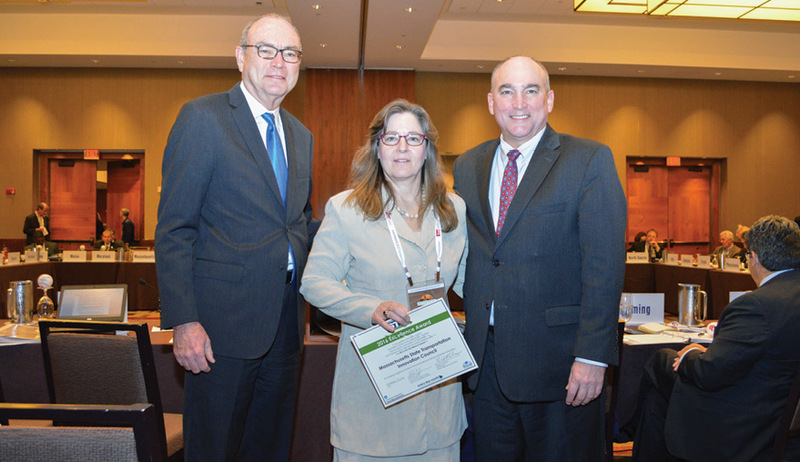 Leadership support and grassroots involvement have contributed to the success of the Massachusetts State Transportation Innovation Council (STIC). Originating from Volpe National Transportation Systems Center in Cambridge, MA, the Webcast featured public agency and private sector members of the Massachusetts STIC discussing how the council is creating an innovative culture in the State. After forming in 2011, the Massachusetts STIC pursued implementation of 27 Every Day Counts (EDC) innovations during the first three rounds of the Federal Highway Administration initiative. For each innovation, the STIC assembles a deployment team that develops an implementation plan and reports on progress at quarterly STIC meetings. Watch an FHWA video on the benefits of STIC involvement. MassDOT also created a READi Committee—named for its mission to review, evaluate, accelerate, and deploy innovation—to provide a central point for integrating new technologies, practices, and products throughout the agency. Massachusetts STIC successes include projects built with the design-build contracting method and deployment of innovations such as e-Construction technologies, smarter work zones, and ultra-high performance concrete connections for prefabricated bridge components. When it comes to innovation, “success builds on success,” said Dennis Baker of the American Council of Engineering Companies of Massachusetts. He cited the use of accelerated bridge construction on the MassDOT FAST 14 project to rapidly replace bridges during a series of short-term closures in 2011. Crews used accelerated bridge construction techniques to quickly replace 14 bridges in a Massachusetts project. Richard Benevento of the New England Chapter of the American Public Works Association discussed the benefits to local agencies of innovation deployment. “It’s important for any public agency, particularly cities and towns, to be able to tap into the innovations coming out of EDC and be at the STIC table to talk about how to do more with less,” he said. STICs are essential to making EDC a State-based initiative and the national STIC network “is the single most important factor in creating a permanent culture of innovation in the transportation sector,” said Federal Highway Administrator Gregory Nadeau. Innovation has been part of the FHWA culture since the Agency’s early days in the late 1800s, and it will continue to be a priority, FHWA Executive Director Butch Waidelich told Webcast participants. Dr. Chris Gerdes, U.S. Department of Transportation chief innovation officer, guided STIC Webcast participants through an exercise to expand discussions on innovations. 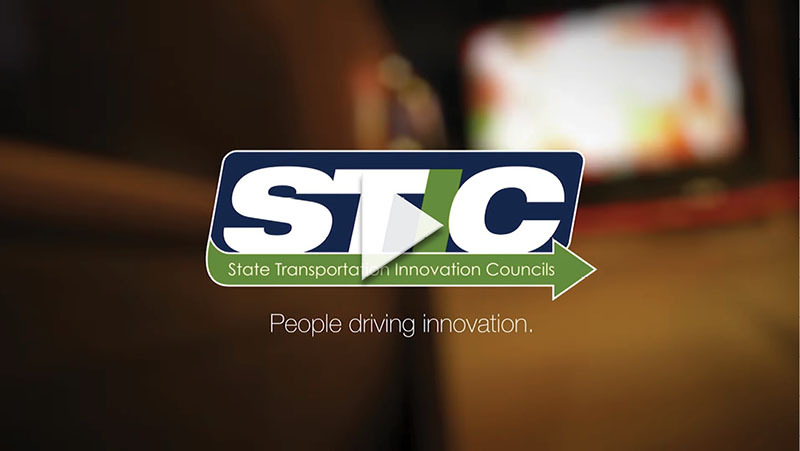 Success in fostering a culture of innovation has earned State Transportation Innovation Councils (STICs) in Kentucky, Massachusetts, and Vermont the first STIC Excellence Awards from the American Association of State Highway and Transportation Officials and Federal Highway Administration. 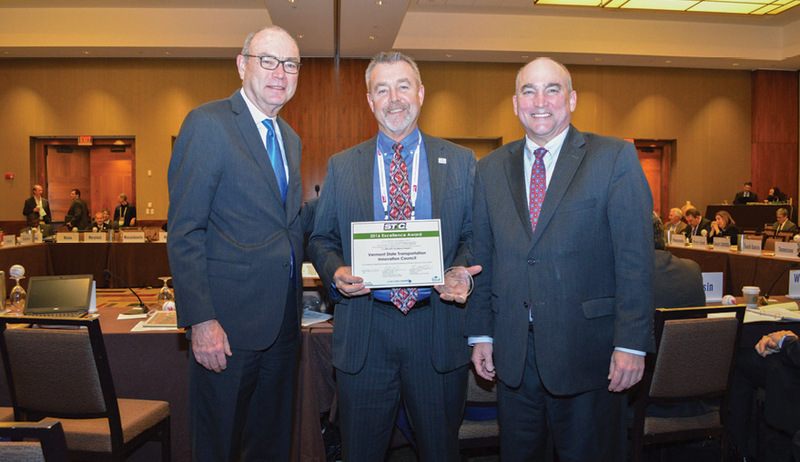 This inaugural award reflects the partnership between AASHTO and FHWA to promote innovation nationwide. 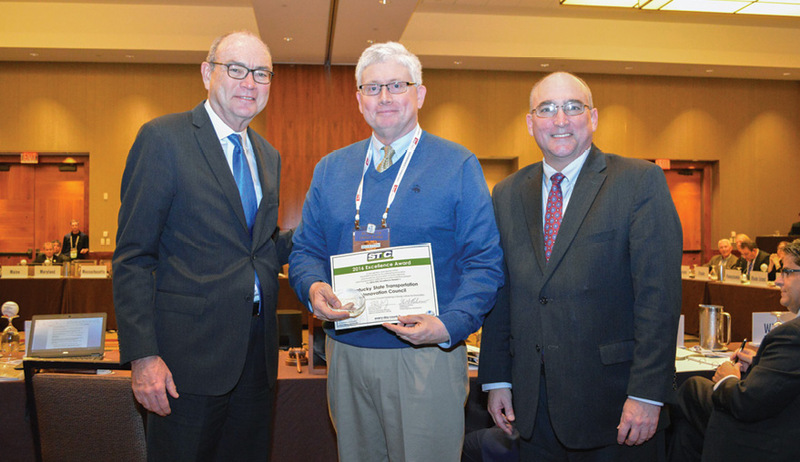 During the AASHTO Board of Directors meeting, AASHTO Executive Director Bud Wright and Federal Highway Administrator Gregory Nadeau offered highlights of the award recipients’ accomplishments. “The Kentucky STIC incorporates crosscutting technology evaluation and implementation of Every Day Counts, the second Strategic Highway Research Program, and traditional research innovations,” Wright said. The Kentucky Transportation Cabinet created a senior management position to lead integration and standardization of innovative processes throughout the State. Use of high-friction surface treatments and the Safety Edge™ paving technique contributed to an 85 percent drop in roadway crashes. An accelerated bridge construction policy encourages continuous innovation on bridge projects. “The multistakeholder leadership of the Massachusetts STIC perpetuates the deployment of innovation throughout the State,” said Nadeau. The Massachusetts STIC influenced the Massachusetts Department of Transportation (MassDOT) to form a READi Committee—for review, evaluate, accelerate, and deploy innovation—to review and recommend innovations for deployment. MassDOT holds an annual Innovation and Tech Transfer Exchange to share new ideas in transportation technology. It used accelerated bridge construction on its FAST 14 project to replace 14 bridges on I–93 over 10 weekends. “The Vermont STIC Executive Council members meet monthly to discuss innovative ideas, advancements in technology, and how they can be used to meet today’s challenges,” said Wright. The Vermont STIC holds an annual meeting to brainstorm innovative ideas with representatives of industry, municipalities, and planning organizations. The Vermont Agency of Transportation established a Performance, Innovation, and Excellence Section to lead innovation efforts. Vermont has institutionalized use of the design-build project delivery method and is considered a regional leader in the contracting technique. Fall 2016 was a busy time of firsts and openings for transportation innovators across the country. Thirteen innovators presented their ideas and shared lessons learned at the first Arizona Innovation Exchange Day in Phoenix. More than 150 transportation professionals attended the October 4, 2016, event organized by the Arizona Council for Transportation Innovation, part of the national State Transportation Innovation Council network. Keynote presentations covered effective decision making and the changing transportation environment. A ceremony in Iowa celebrated the opening of the Catt Bridge in Buchanan County. The new bridge features a glued laminated timber—or glulam—superstructure supported on a geosynthetic reinforced soil abutment. The U.S. Forest Service and Iowa State University’s Institute for Transportation developed the innovative design and Buchanan County work crews built the bridge. The Federal Highway Administration provided technical assistance on design and construction. The city of Concord, NH, held a ribbon-cutting ceremony to mark the completion of its Main Street reconstruction project. The project, which received a Transportation Investment Generating Economic Recovery, or TIGER, grant, was New Hampshire’s first to use the construction manager/general contractor delivery method. The project was designed to improve vehicle, bicycle, and pedestrian safety and transit accessibility. New Mexico’s first diverging diamond interchange is open to traffic. The new interchange at I–25 and Cerrillos Road in Santa Fe was completed on time and on budget. The New Mexico Department of Transportation chose the diverging diamond design to improve safety and efficiency, reduce congestion, and accommodate future traffic needs. Visit the project Web site for a virtual tour of how to drive the interchange. Accelerated bridge construction, including geosynthetic reinforced soil-integrated bridge system technology, enabled the Rhode Island Department of Transportation (RIDOT) to save motorists a year of traffic delays on projects to replace two bridges in East Providence. One bridge was replaced during an 83-hour road closure between September 9 and 13, 2016. The other bridge replacement was even faster, with the shutdown lasting 65 hours from September 23 to 26. RIDOT plans to use accelerated bridge construction on 75 bridge repair projects by 2025. Officials celebrate an interchange opening on Wisconsin’s I-41 project. 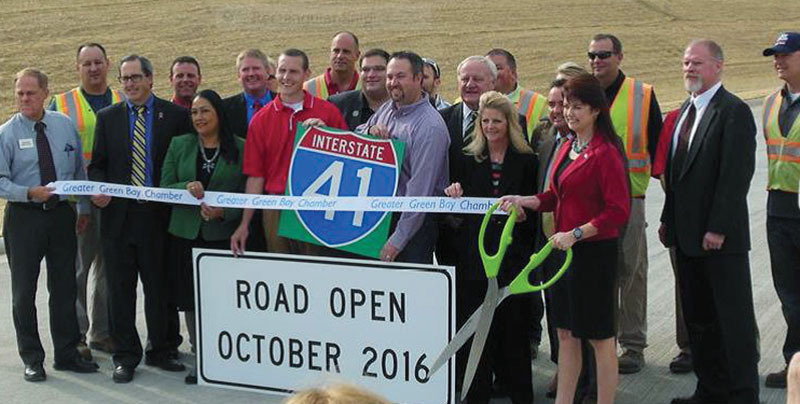 The Wisconsin Department of Transportation held a ceremony in Green Bay to celebrate the substantial completion of the I–41 project and the opening of the I–41/I–43 system interchange to traffic. The project, one of Wisconsin’s largest highway construction projects, spans more than 30 miles in Brown and Winnebago Counties and includes reconstruction or improvement of 16 interchanges and 40 roundabouts. The project will be fully completed in June 2017.